Robert Holmes: A Life In Words book review . 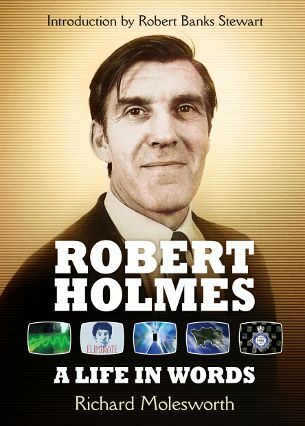 If he were still with us, Robert Holmes would probably be bewildered and appalled at becoming the subject of a book. A humble man, he referred to himself as “just a hack script writer”. Classic Who fans disagree; for many, this pipe-smoking one-time copper remains the series' definitive writer – and with good reason. Holmes wrote classics like "The Talons Of Weng-Chiang" and “The Caves Of Androzani”, script edited the series throughout a mid-70s high period, and made countless significant contributions to Who lore: this is the man who created the Master, the Sontarans and the Autons, and who first named the Time Lords' home planet. Don't expect to learn much about Holmes's private life; the focus is very much on his writing. However, his personality does shine through in quotes from old interviews and fanzine articles, and in the warm recollections of colleagues like writer Chris Boucher, who describes being script edited by "Bob" (as everyone called him) as like being prodded along by an encouraging schoolmaster. Meticulously researched, the book draws on the BBC's written archives to paint an incredibly detailed portrait of Holmes’s career, covering not only his time on Who but also his prior work on long-forgotten series like Knight Errant and Family Solicitor , and later scripts for shows like Shoestring and Bergerac . Early on in particular, some of the fruits of Richard Molesworth's labours make for heavy going, unless ploughing through Emergency Ward 10 episode synopses thrills you to the core. But compensation comes in the shape of treats from Holmes's personal files. These include pitches for numerous never-made TV series (some SF, like Schizo , a thriller about compassionless human mutants, and Lituvin 40 , a planned team-up with Who producer Philip Hinchcliffe about an experimental drug that’s actually an alien chemical) and Holmes’s original breakdowns for stories like “Carnival Of Monsters” and "The Time Warrior", which contain some fascinating differences from the finished scripts - the first time he set it down in black and white, it was spelt "Galfrey"! Other treats include The Space Trap , the spec submission for a standalone SF serial which first caught the attention of the Who production team, and his proposed storyline for a 20th anniversary special called “The Six Doctors” (yes, six!). These rarities make A Life In Words a treasure trove of delights for anyone who venerates the name Robert Holmes – as every Who fan should.